For Nicky, drawing is a method of problem solving as well as generating concepts and ideas, it gives her a freedom to work fluently and originally. Drawing underpins every illustrative project she undertakes. 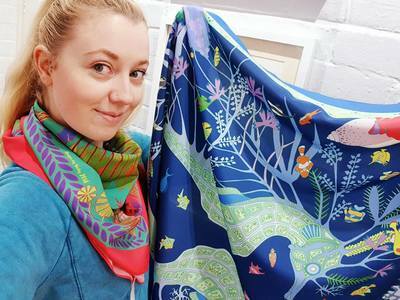 With a BA in Fine Art and an MA in illustration, her practice has a balance between traditional and digital mediums and styles making her versatile in today's competitive industry whilst maintaining her artistic voice. Work currently in the gallery includes hand designed cushions, scarves and small items such as toiletry bags, fabric books and keyrings. She colours the designs in digitally before getting them professionally produced at high quality. She then hand sews each individual item. ​She also draws exquisite, detailed pictures in pencil which are embellished with silver or gold leaf. Whilst abstract in style they have a Purbeck theme such as Jurassic ammonites and shells. Nicky has a second string to her bow. She is a natural and gifted teacher with a strong reputation and client base that enrol year on year. She runs classes in Swanage at the gallery, Corfe Mullen and Poole. Nicky has been so successful that she now has 2 sessions per week in Swanage to choose from. See our workshops page for more details.